John Newell was a son of Rachel Newell of North Street, Stewartstown and the late William Newell. 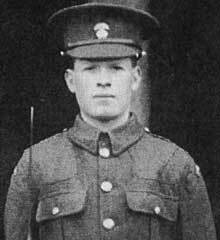 John was born in Stewartstown John had served along with his elder brother, Joseph; when Joseph was killed in action just over two weeks earlier. John was killed in action on 7th November 1914 when his unit was sent out to recover trenches on the edge of Ploegsteert Wood. Two desperate assaults were made during which John was killed. The Ploegsteert Memorial stands in Berks Cemetery Extension, which is located 12.5 Kms south of Ieper town centre, on the N365 leading from Ieper to Mesen (Messines), Ploegsteert and on to Armentieres. From Ieper town centre the Rijselsestraat runs from the market square, through the Lille Gate (Rijselpoort) and directly over the crossroads with the Ieper ring road. The road name then changes to the Rijselseweg (N336). 3.5 Kms along the N336 lies a fork junction with the N365. The N365, which forms the right hand fork, leads to the town of Mesen. The Cemetery lies 3 Kms beyond Mesen on the right hand side of the N365, and opposite Hyde Park Corner Royal Berks Cemetery.